We cruised through the night to the mouth of the Mississippi River, where we went up the southwest pass for a bit yesterday. The point was to get a salinity/nutrient profile so that we can accurately judge which phenomena we see in on the shelf are biological vs. due to dilution effects from the river plume. Then we proceeded to the A’ and A transects, which we finished during the night. Starting the B transect this morning. I’m on the 7am-7pm shift, which is nice. Sea state is very mellow. Overcast the last couple days with scattered showers, 2-4 ft swell. The Pelican is a nice ship. Good stability, good food! Not great internet. 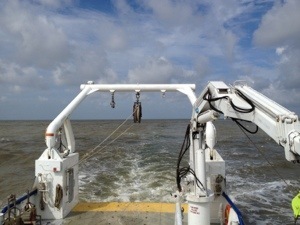 Check out the official shelf wide cruise blog, which also has a map of our sampling stations. I’ll try to give updates whenever we’re close enough to land for cellular data.